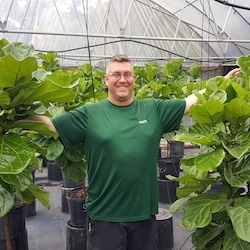 Tampa, FL, March 11, 2019 --(PR.com)-- PLANTZ, a Tampa-based plant sales and leasing company, has successfully delivered quality indoor foliage plants to customers in each of the lower 48 states, Alaska, and Washington, DC. With a recent shipment to a customer in Wyoming, PLANTZ hit this important milestone in its quest to become the nation’s leading online distributor of indoor foliage. In the Tampa Bay and Lakeland, Florida markets, the company provides plant leasing, landscaping, and horticultural services to more than 400 area businesses. In 2017, it opened its nationwide storefront at plantz.com to meet a growing demand for high-quality indoor plants. Trends are in the company’s favor. With most Americans spending more time inside than outside, bringing life to the interior environment is in vogue. Green plants pump oxygen in to the air, while filtering out airborne pollutants and volatile organic compounds. They can change the mood in a room, making people feel safer and more content. In offices, plants have been proven to reduce stress, improve productivity, and even reduce absenteeism. Aside from all that, they look nice and make people happy. One of the keys to the success of PLANTZ has been its partnership with FedEx. “It’s obvious that our success depends on solid packaging techniques and our ability to land a plant on someone’s doorstep thousands of miles away,” said John Crandall, the manager at PLANTZ who is responsible for getting the plant safely to a customer. “We have experimented with several packaging methods and worked through some good ideas and some not-so-good ones,” continued John, “but once we put it on a FedEx truck, it’s up to them to get it to the customer in great shape.” And they have delivered. Since PLANTZ began its nationwide sales efforts, FedEX has delivered over 3,000 orders of plants and their supplies throughout the United States including a Giganta Plant to Juneau, Alaska – the company’s longest shipment yet. There are headwinds for the company moving forward, especially since Amazon has expanded its plant selection. Stanford’s contention might be proved out in the ratings and reviews it gets from its customers. Currently, it has 5-Star ratings for all its plants except two, which have 4.5-Star ratings. The company hopes to double its online sales in 2019 by adding new plants, products, and supplies to its offering. So far, it’s off to a good start with both January and February sales outpacing last year. “We’ll continue to source the best plants from Florida and Hawaii in support of our mission – to make people happy with plants,” Stanford added.